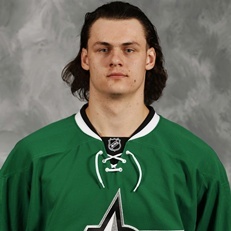 Probable future Texas Stars defenseman Troy Vance was assigned by Dallas to the ECHL's Elmira Jackals late yesterday. Vance was drafted in the fifth round in 2011 and just finished his major junior hockey career. His Charlottetown Islanders fell in the first round of the QMJHL playoffs to Halifax in four games. Vance will likely play for the Texas Stars and/or Idaho Steelheads next season, but the timing of his major junior season completion this year put him elsewhere. If he were to come to Texas, it's unlikely he would find his way into the lineup with any regularity given the players already here. If he were assigned to Idaho, he would not be eligible for the playoffs. To be eligible, a player must play five ECHL regular season games. Idaho only has four remaining. Elmira, however, has five. Vance is eligible to play in the playoffs for the Jackals if he plays in each of those games, which is better than him getting into four games in Idaho and then shutting it down for the season. The Elmira Jackals announced today that rookie defenseman Troy Vance has been reassigned by the Dallas Stars of the National Hockey League to the Elmira Jackals from the Charlottetown Islanders of the Quebec Major Junior Hockey League and the club has also signed forward Ryan Rashid (RA-shihd) to a standard player's contract. Vance, 20, joins the Jackals following the conclusion of his junior season with Charlottetown of the QMJHL. The Goshen, New York native set career highs with eight goals and 29 points in 59 games with the Islanders. The 6-foot-5 220-pound defenseman recorded 83 points (17 goals, 66 assists) in 206 career QMJHL games combined between the Victoriaville Tigres, Prince Edward Island Rocket and Charlottetown. Vance was drafted in the fifth round (#135) by the Dallas Stars in the 2011 NHL Entry Draft.